As many of you know, I am quite set in my makeup routine and am certainly no beauty guru. Red lip, cateye, peachy blush and I’m good to go. This spring though I am really excited to try out some new color palettes, starting with one of my favorite cosmetic lines, tarte ! So I wanted to share with you 8 of my top favorites from the line. It’s been ages since I have put any shade of pink on these lips, but this season I am pumped to try it out. Change is good right? I am obsessed with tarte’s lip tint colors in Charmed (light pink), Enchanted (magenta), and Joy (peach). I can see myself wearing all of these on a breezy spring day. Another favorite tarte product I love is their full coverage foundation. I am terrible at re-applying throughout the day, however their foundation keeps me in check all day without the hassle of worrying about touch-ups… pretty perfect for anyone on the go if you ask me. For spring I am also stoked on rose and dusty pink blush. Lately I have been sticking to a dash of bronzer, however I am so looking forward to rocking these bright and cheery tones! As far as mascara goes, I have been obsessed with tarte’s Lights Camera Lashes mascara. I hardly ever wear fake lashes, as much as I want to, I just never seem to apply it correctly! This mascara however does the trick. Basically fake lashes in a tube, haha. And lastly the tarte product I am obsessing over the most is their precision eyeliner. One thing that I do not see changing in my makeup routine anytime soon is of course, the cat eye. I can’t help it, I have become so accustomed to it, I almost feel naked without one! This liner is great for getting that perfect winged tip. 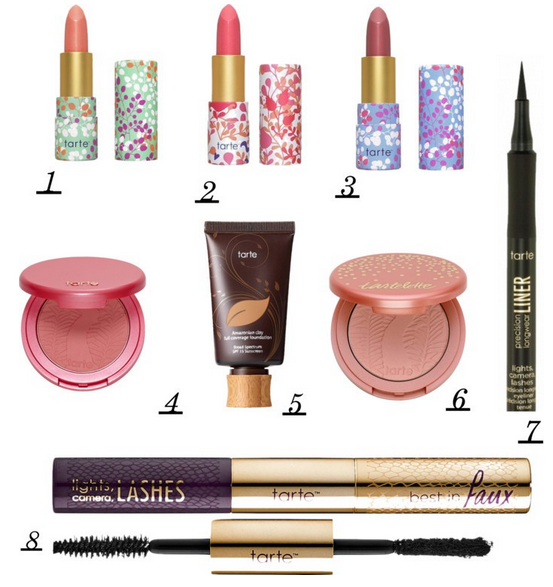 So there you have it, a roundup of my favorite beauty items for spring, featuring tarte! I hope to do more beauty reviews on Flashes of Style. If you guys have any requests let me know! Love it! Ive never tried Tarte! I think ima try it! Tarte is one of my favorite cosmetic brands also! I have a sick obsession with their amazonian clay blushes! I have way too many of them and I can't stop purchasing new colors! lol I don't think I've ever finished any either which is the worst part about it! You should do a review on the Anastasia liquid lipsticks! They're all the rage right now and there's a pretty wide range of colors to choose from! Websitenya bagus, postinganya juga menarik. Semoga bermanfaat sekali bagi pengunjungnya .. I love Tarte! Their foundation is the best. I'll never use anything else! I love your blog Ms. Bonnie Barton, you're such a fashionista! It’s the best source of information, I really love this post! Keep up the good work.